Purchase the Bobblehead Package to Guarantee All Four! NILES, OH - The Mahoning Valley Scrappers are pleased to announce the four bobblehead giveaway dates for the 2019 season. The full-sized bobbleheads include Michael Brantley (rehab assignment July 2016), Scrappy, and former Scrappers Shane Bieber (2016) and Jesus Aguilar (2010). Join us on game dates, Saturday, June 29 (Brantley presented by Toyota of Warren), Saturday, July 6 (Scrappy presented by the Eastwood Mall Complex), Friday, August 9 (Bieber presented by Auto-Owners Insurance - Paige and Byrnes Insurance, Daubenmire Insurance and Champion Insurance of Austintown - Tom Uher) and Saturday, August 17 (Aguilar presented by Western Reverve Orthotics & Prosthetics Centre) for the giveaways to the first 1,000 fans, presented by 21 WFMJ. Gates will open at 6:00pm. 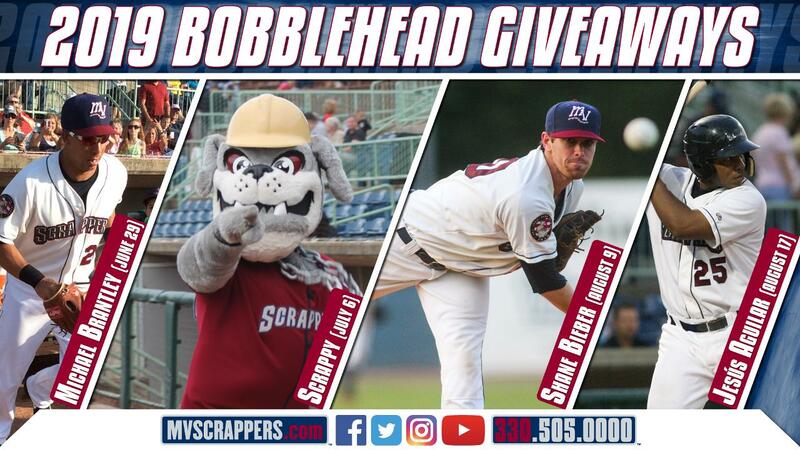 Guarantee all four bobbleheads with the Bobblehead Package, which also includes a game ticket to each bobblehead night and Scrappers Opening Day on Sunday, June 16. Bobblehead Packages start at $45 and are on sale now. They can be purchased online by clicking here, at the Chevy All-Stars Box Office at Eastwood Field or by calling (330) 505-0000. Packages are limited. The Mahoning Valley Scrappers are the Short Season Single A Affiliate of the Cleveland Indians and open up the 2019 season at home on Sunday, June 16 at 6:35pm against the Batavia Muckdogs. For more information about individual game tickets, ticket packages or group outings visit mvscrappers.com or call the front office at (330) 505-0000.